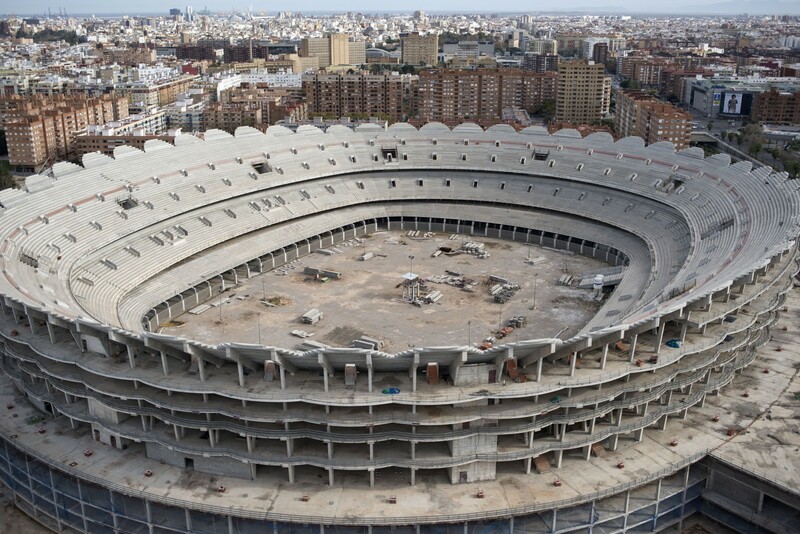 Nou Mestalla Stadium is the planned new stadium of Spanish football league club Valencia CF. Work began on the stadium in August 2007, but was halted in February 2009 due to lack of funding. It remains untouched with an additional 150 million euro needed to complete it. In the years leading up to the 2008 financial crisis, Spain experienced a construction boom. The boom turned to bust leaving millions of homes and other large construction projects, such as this one, vacant. Ever since its real estate bubble burst in 2008, Spain has been on a downward spiral sparking a financial crisis that has spread throughout the country. Dubbed “The Spanish Crisis” Spain currently has one of the highest unemployment rates in Europe at 26% throwing millions out of work and unable to keep up with mortgage and rent payments. Spanish courts have forced millions out of their homes with more than 250,000 eviction orders executed since the crisis first began. An average of 200 people are thrown out of their homes each day whilst many others are left uncertain of their fate, living each day out of a box. Fear and desperation, and in some cases suicide, is common. Eviction is a very sensitive subject in Spain and the current situation is that of a state of limbo. The banks and government, just as with the people themselves, are desperately waiting to be saved. Evictions have become the overwhelming symbol of the crisis. News of cases cause a ripple effect across the country sparking mass protests from those that have simply had enough. The crisis has affected many aspects of Spanish society and this photographic project looks at the different effects it has had, focusing on those waiting to be evicted and the visual reminders of the crisis that can be seen all over the Spanish landscape. Although in recent weeks the situation has apparently begun to improve according to published statistics, fear and desperation are still prevalent in all of the country. Manolo, leader of the Stop Desahucios (stop eviction) group in the Spanish city of Valencia, gives advice to locals who have all received eviction notices from the banks. Meetings like these happen all over Spain helping those who are awaiting evictions as well as those just starting out in the eviction process. There have been over 250,000 eviction orders executed by the Spanish courts since Spain sank into recession back in 2008, throwing millions out of work unable to keep up with mortgage and rent payments. Milagros, 48, is facing eviction after not paying her mortgage for over six months since her husband’s death. His pension leaves her with only 450 euros to feed her three children and since she is not able to pay the Spanish government has now begun to try and take her parent’s home, in order to pay the debt as their names are down on her mortgage as her next of kin. Evictions in Spain were up by 16.7% at the end of 2012, averaging more than 200 per day. Emilio has been unemployed for two years, he and his wife Ludmyla are struggling to survive on just her wage alone. They plan to move abroad like many people in Spain in the hope of finding work. Stop Desahucious (Stop Eviction) is a movement all across Spain that helps people to fight back against the government from being evicted. It was started and is made up of people who have been evicted as a result of the crisis. Kennedy sits waiting on his eviction day in his home in Madrid that he shares with his wife and three children whom he moved out a few days earlier. Kennedy took out a mortgage when the economy was strong but found his payments drastically increasing due to inflation leaving him unable to keep up with his mortgage. A picture of Kennedy’s wife is the only personal possession in the house. Everything else has been removed to prepare for the imminent eviction. Kennedy stands waiting on his eviction day in his home in Madrid that he shares with his wife and three children whom he moved out a few days earlier. Kennedy took out a mortgage when the economy was strong but found his payments drastically increasing due to inflation leaving him unable to keep up with his mortgage. Chary aged 40 has three children and is awaiting eviction after receiving her notice when her youngest child was just fifteen days old. She is now living with her mother as the electricity has been cut off from the home and expects the eviction to happen any day. Vicent and his parents are awaiting eviction. Vicent’s parents Pedro and Carmen are both unemployed after the factories they worked for unexpectedly closed down. Like many people they have boxed up all of their possessions, as their eviction is imminent. Pedro and his son Vicent are awaiting eviction. Pedro and his wife Carmen are both unemployed after the factories they worked for unexpectedly closed down. Like many people they have boxed up all of their possessions, as their eviction is imminent. Teresa lives in Madrid with her cousin and niece whom she looks after. Even with two jobs she is unable to pay her mortgage of 800 euros per month and faces eviction from her bank. Sorry for the inconvenieces I am the head of a family. I have a 4 years old kid and I have no Job neither any help from anyone. I am forced to beg to suppport my family. I am embarrased about it but I am happy, I prefer this than stealing. God bless you. Thank you very much. A crumbling piece of land stands for sale in Madrid. For sale signs can be seen all over Spain since the real estate bubble burst in 2008 forcing many people to sell their properties at a fraction of the price. The President of the neighbourhood association speaks at a protest in front of locals in the impoverished neighbourhood of Nazaret, Valencia. The community in Nazaret has been protesting for years for the roads to be widened so that medical services can enter the neighborhood, but due to government cuts there are many areas like Nazaret across Spain that are feeling the full effect of the crisis. This wall surrounds the impoverished neighbourhood of Nazaret in Valencia, Spain. Built in 1992 it’s locals believe that they have been segregated from the rest of Valencia, with the wall being placed there by the government to hide what is truly happening in Spain from tourists and the world. Francisco and Ansunción are both unemployed. Francisco has been unemployed for five years after being made redundant from his construction job, living on 400 euros per month from his redundancy pay. He plans to move abroad for work like many Spaniards, as they will soon be unable to afford to live. Victoria Maria Lopez aged 55 has Friedreich ataxia, a disability that causes damage to the nervous system leaving her unable to walk or talk properly. Due to the privatisation of the hospitals in Spain she now has to pay for her medicine which costs €8 per item. This is one of many cuts that the crisis has caused across Spain affecting Spain’s elderly and disabled. Victoria Maria Lopez aged 55 has Friedreich ataxia, a disability that causes damage to the nervous system leaving her unable to walk or talk properly. Due to the privatisation of the hospitals in Spain, Victoria now has to pay for her medicine and care which was once free uner the government. This is just one of the many cuts that the crisis has caused across Spain affecting Spain’s elderly and disabled. A man uses a Bankia cash machine covered in anti-government and bank graffiti. Bankia is one of many banks in Spain that is currently evicting people from their homes. Puertas Mavisa an abandoned door factory in Villacañas, Spain. This factory once employed over 5,000 people much like many other factories in this industrial town. Soon after the crisis began factories such as this were left abandoned across this now desolate town. An abandoned housing development in the town of Villacañas, Spain. It is developments such as these scattered all across Spain that sparked the economic downfall five years ago causing towns such as this, once a wealthy industrial town to nothing but a ghost town.